Most profoundly, regarding the American role in Iraq, the report moronically splits the difference of troops staying or leaving, without ever examining the basic premise of the U.S. government taking responsibility for the country's minutiae, such as its setting up public works projects. Instead, the report unthinkingly accepts that strategic assumption and only tweaks tactics at the margins. A preposterously lengthy list of 79 recommendations lies at the heart of the report. These include such gems as bringing in the (Saudi-sponsored) Organization of the Islamic Conference or the Arab League (no. 3) to decide Iraq's future. Another creates an "Iraq International Support Group" that includes Iran, Syria (no. 5), and the United Nations secretary-general (no. 7). Other brilliant recommendations call for the UN Security Council to handle the Iranian nuclear problem (no. 10) and for the support group to persuade Tehran to "take specific steps to improve the situation in Iraq" (no. 11). Right. The Iranian regime, whose president envisions a "world without America," will save Washington's bacon. Such counsel smacks at best of what the Jerusalem Post calls "staggering naïveté" and at worst of ghastly foolishness. 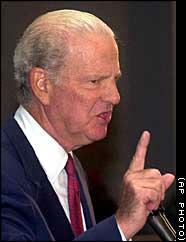 Of course, small minds assert that problems in Iraq are "inextricably linked" to the Arab-Israeli conflict – thereby repeating the precise mistake that lead co-chairman James A. Baker, III, made in 1991. He then led the effort to abandon the Persian Gulf and turn to the Palestinians, leaving Saddam Hussein in power for another dozen years and contributing directly to the present mess. In the new report, Mr. Baker and his colleagues call for a Palestinian state (no. 12) and even demand that a final settlement address the Palestinian "right of return" (no. 17) – code for dismantling the Jewish state. They peremptorily declare that "the Israelis should return the Golan Heights," in return for a U.S. security guarantee (no. 16). 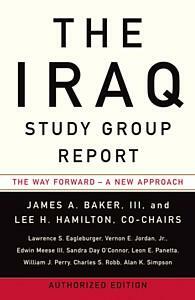 James A. Baker, III, instructs the president how to use the "Iraq Study Group Report." To make matters worse, Mr. Baker had the nerve to admonish the Bush administration not to treat the report's 79 recommendations "like a fruit salad," choosing one idea while rejecting another, but to accept it as a whole. Even in Washington, a town famous for arrogance, this statement made heads turn. That Mr. Baker and his co-chairman, Lee Hamilton, sat for a picture spread with famed photographer Annie Liebovitz for Men's Vogue, a fashion magazine, only confirms the vacuity of their effort, as does their hiring the giant public relations firm, Edelman. Although the press reacted to this drivel, in the words of Daniel Henninger writing in the Wall Street Journal, with "neurotic glee," Robert Kagan and William Kristol deemed it "dead on arrival," and Iraq's president, Jalal Talabani, called it "dead in the water." One hopes they are right, that President George W. Bush ignores its recommendations, and that this "new lipstick on a very old pig" (Spencer Ackerman) quickly disappears from sight. That's not to say that Mr. Bush should "stay the course," for that course has not worked. A host of creative ideas have been floated by individuals knowledgeable about Iraq, sympathetic to the administration's goal of building a free, democratic, and prosperous Iraq, and not tempted to see their role as an exercise in preening. The White House should call on these talented individuals to brainstorm, argue, and emerge with some useful ideas about the future American role in Iraq. Doing so means breaking with a presidential tradition, going back at least to 1919, of what I call a "know-nothing" Middle East diplomacy. Woodrow Wilson appointed two completely unqualified Americans to head a commission of inquiry to the Levant on the grounds, an aide explained, that Wilson "felt these two men were particularly qualified to go to Syria because they knew nothing about it." This know-nothing approach failed America 87 years ago and it failed again now. 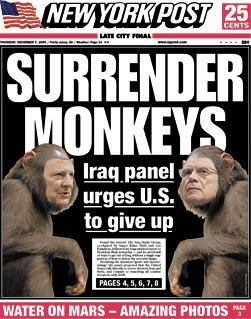 New York Post front page, December 7, 2006.